The Best 7 Photo Real Hat and Cap Templates Ever Created! Last summer our design department set a massive goal; To set the benchmark for the next generation of apparel and head wear templates. If we may say so…we smashed the apparel templates out of the park! Not only did we offer the usual front, back and side templates, but we developed the first ever, 45 degree angled template profile! The angled profile, (that is trending on high-end ecommerce stores like nike.com), allows you to easily insert your own artwork as a flat 2D layer. The template then seamlessly warps and moulds the artwork to the fabric on the correct viewing plane. After achieving success in the apparel department, we directed our attention to the headwear. After having our new templates released for a short time, we began receiving really positive feedback from our PrePress Toolkit design community about our work. We appreciate the good and the bad, but feedback that lets us know what our clients like and are looking for, motivates us to produce even better, newer, fresher products than anyone else out there. We took all suggestions and yep, you guessed it, created these for our valued community! So, if you’re here for the new hat and cap photoreal mockup templates, check them out further on this page in all their digital pixel glory! Also explore our Apparel Design Templates at www.prepresstoolkit.com and let us know what you think in the comments section below, or leave us a note on our contact page. The all new underbrim and angled profiles offer a unique option that compliments the front view profile when showcasing your artwork. With the use of Photoshop’s smart objects layer, your flat artwork will be transformed into a high-end photorealistic mockup. Let the designing begin! 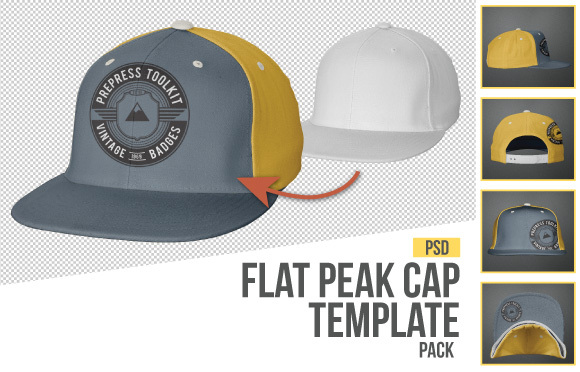 Download The Flat Peak Cap Design Template Pack. Also available in Vector format (AI + EPS files). Click here for Vector Pack. Get your trucker on! This cleverly designed, custom, mockup template, allows you to color the front and peak panels with whatever color you wish…but you’ve already seen that haven’t you? What you wouldn’t have seen though, is the ability to color the mesh portion of the cap AND have the background of the image visible through the gaps in the mesh. Nice! 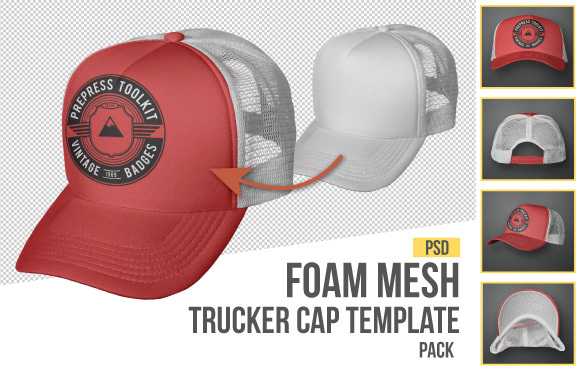 Download The Foam Mesh Trucker Cap Photoshop Template Pack. All PrePress Toolkit photo-real templates are made with a transparent background so you can swap out the background image to be what ever you like, this helps to set the tone of your e-commerce store or design project. 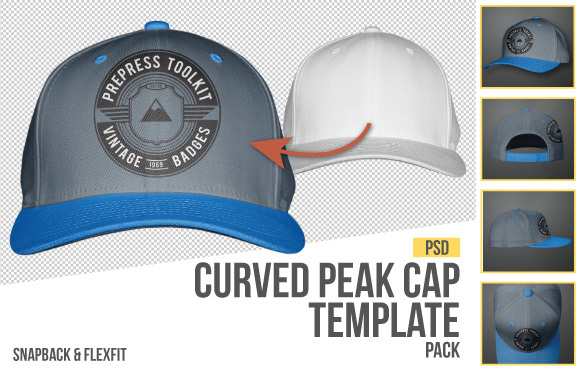 Download The Curved Peak Cap Photoshop Template Pack. 5 Panel Caps are known for their unique choice of patterned fabrics so we ensured that adding fabric patterns would be a piece of cake. Go nuts and make every panel a different fabric pattern. 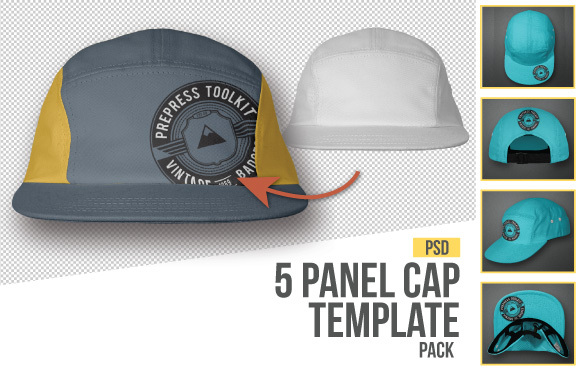 Download The 5 Panel Cap Photoshop Template Pack. 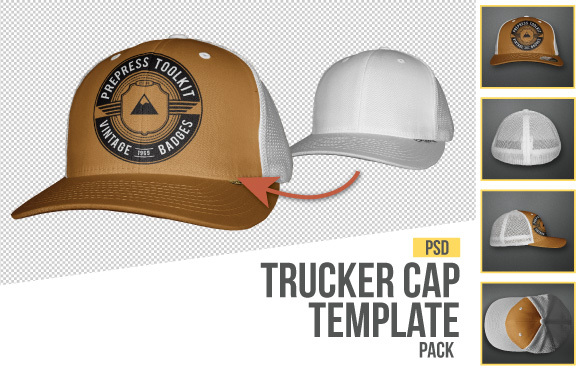 Download The Trucker Cap Photoshop Template Pack. Front, Angled front, Side, Under-brim and back profile views. 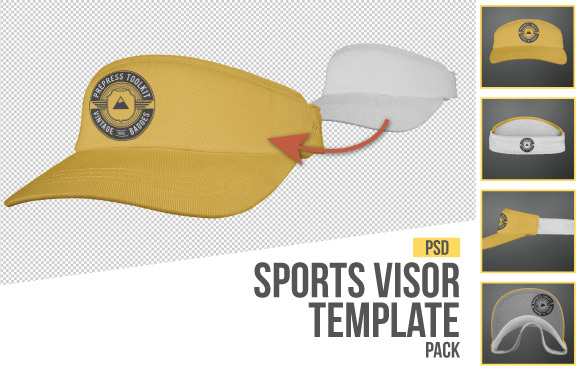 Download The Sports Visor Cap Photoshop Template Pack. Front, Angled front, Side, Under-brim and back and top profile views. 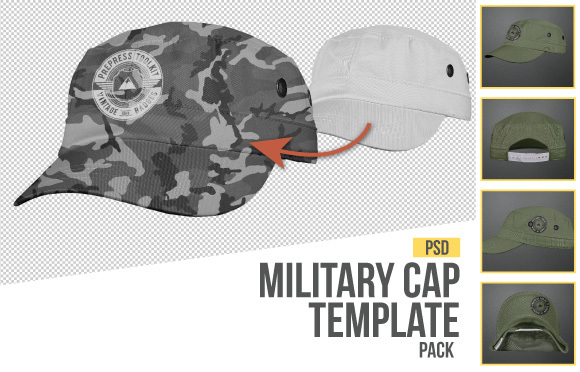 Download The Military Cap Photoshop Template Pack. Hi I have purchase a package of your templates and I think they are great. I was wanting to know if you have a template of a Trucker Cap with a flat brim? Hi Billy, Great to hear you’re loving the templates. Thanks for taking the time to ask this question. A flat peak option would be a great addition to this template. We will consider adding this option in the future however at the moment we are not in a position to do a reshoot. We’ll email you straight away if/when the option becomes available. (It would be a free download for you) Thanks again!